Amongst the hustle and bustle of life today, we have a comforting reminder of the best bits of bygone eras on hand to ease those modern life blues. Our new living room furniture and dining room furniture possesses the essence of retro style, with modern functionality, elegance, and timeless suitability in mind. Everything is available to purchase now in our online store. 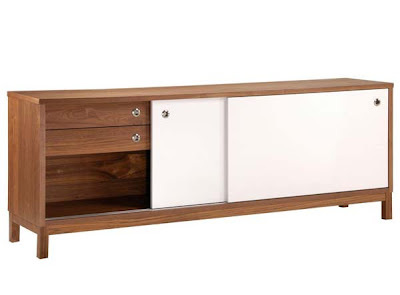 Part of the extensive Marlo Walnut living and dining room furniture range, this 70s inspired sideboard has a casual, quiet look and refined lines. Pieces from this collection are made from solid walnut, accented beautifully by crisp white doors, table tops and upholstery. Metal ring handles provide a classic vintage finishing touch. Every social butterfly needs a place to entertain in style, and hosting dinner parties in the New Year will be all the more enjoyable with a stunning dining set like this. The Chalta range lends an extravagant air to proceedings, so you’d better make sure your food and guests do it justice! 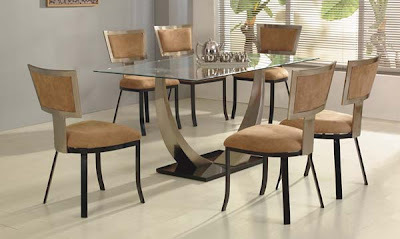 This six seater set is available with black or tan chairs, and centres around an innovative table design. Gently curved legs and sleek glass and suede surfaces give these pieces tactile appeal with a sense of adventure. The Isy collection features some sleek pieces to transform a tired hallway into a welcoming, refreshing space. 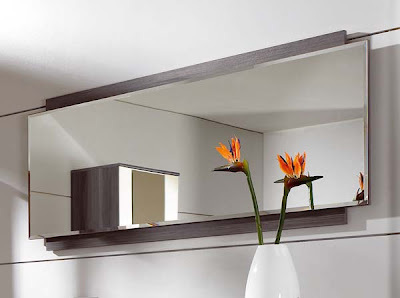 The range is made up of coat stands, shoe cabinets and matching mirrors. Available in charcoal or walnut with fresh white accents, it has the light, stylised look of 60s furniture, brought bang up to date with modern, refined lines. Pieces from the Isy range will help regain control over the clutter that tends to accumulate in the well used and often overlooked entrance to all homes. A must have for every disco diva, this chrome embellished oval-shaped beauty is packed with features - it houses two stools and a handy drawer. 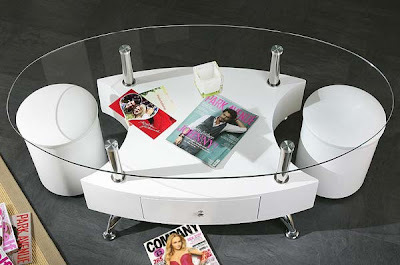 The cylindrical stools have upholstered tops, and nestle happily in the concaves of the table’s curvaceous body. The sleek oval glass top will provide an effortlessly smooth stage for all you need close at hand when enjoying some me-time. Established in 1999, Furniture 123 (http://www.furniture123.co.uk) is the UK’s most experienced online furniture retailer offering a fantastic selection of items for every room in the house, as well as the garden, all accessible from the comfort of home. All products sold on Furniture123.co.uk come with free delivery to mainland UK, including over 1,900 items with free next day delivery. A 10 working day money-back guarantee ensures that customers are able to receive a full refund if they change their mind about their purchase. Pin It Now!